Trump Would Exempt Canada, Mexico from Tariffs if New NAFTA Deal Reached - Integration Through Media ....! 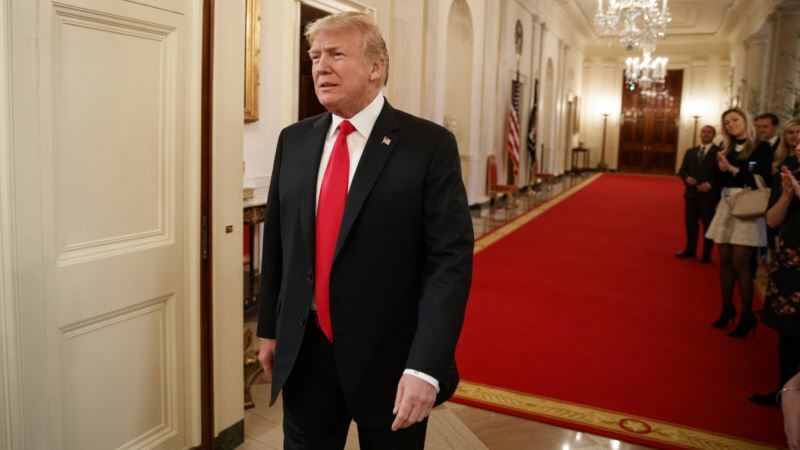 (VOA): U.S. President Donald Trump says Mexico and Canada would be exempted from his planned tariffs on steel and aluminum imports if they can reach a "new and fair" trade agreement with the United States. The three countries are currently in negotiations on revising the North American Free Trade Agreement, with the latest round of talks wrapping up in Mexico City. Trump contended Monday on Twitter the 24-year-old agreement "has been a bad deal for U.S.A. Massive relocation of companies & jobs." He added, "Canada must treat our farmers much better. Highly restrictive. Mexico must do much more on stopping drugs from pouring into the U.S. They have not done what needs to be done. Millions of people addicted and dying." He said that "To protect our Country we must protect American Steel! #AMERICA FIRST." In 2016, the last year with complete government statistics, the United States said it sent $12.5 billion more in goods and services to Canada than it imported, while it had a $55.6 billion trade deficit with Mexico. Canada is the largest U.S. trading partner and last year shipped $7.2 billion worth of aluminum and $4.3 billion of steel to the United States. The tariffs - 25 percent on steel and 10 percent on aluminum – would hit other U.S. allies: Britain, Germany, South Korea, Turkey and Japan. But China, the world's biggest steel producer would be less affected, it only sends two percent of its supply to the United States. White House trade adviser Peter Navarro said Sunday that Trump is not planning to exempt any countries from the tariff hike. Navarro told CNN that final details on Trump's anticipated 25 percent tax on steel imports and a 10 percent tariff on aluminum should be completed by later in the week or early next week at the latest. Trump's new tariffs for the key metals have drawn wide condemnation from business-oriented Republican lawmakers in the U.S., as well as Canada and the European Union. But Navarro said the tariffs are needed to "protect our national security and economic security, broadly defined." He dismissed concerns from Defense Department officials who voiced support for targeted tariff increases aimed at specific countries but not increases on the imported metals from throughout the world. Navarro called it "a slippery slope" to target only some countries with increased tariffs while exempting others. He said there would be a mechanism to exclude some businesses, on a case-by-case basis, from having to pay higher prices for the imported metals. Navarro said the message to the world on U.S. trade practices is simple: "We're not going to take it anymore. We don't get good results," Navarro said, adding that U.S. trade overseas is "not fair and reciprocal." In another news talk show appearance, Commerce Secretary Wilbur Ross told ABC News that Trump has talked with "a number of the world leaders" about his trade tariff plans. British Prime Minister Theresa May's office said that in a Sunday phone call with Trump she had "raised our deep concern at the president’s forthcoming announcement on steel and aluminum tariffs, noting that multilateral action was the only way to resolve the problem of global overcapacity in all parties’ interests." U.S. Commerce Secretary Ross said the total value of the impending U.S. tariffs amounts to about $9 billion a year, a fraction of 1 percent of the annual $18.6 trillion U.S. economy, the world's largest. "So, the notion that it would destroy a lot of jobs, raise prices, disrupt things, is wrong," Ross said. Ross dismissed European Union threats of imposing retaliatory tariffs on such prominent American products as Harley Davidson motorcycles, bourbon and Levi's jeans as unimportant and a "rounding error." In response on Saturday, Trump threatened European automakers with a tax on imports if the European Union retaliates against the U.S. Ross called the possible European levies a "pretty trivial amount of retaliatory tariffs, adding up to some $3 billion of goods. In our size economy, that's a tiny, tiny fraction of 1 percent. So, while it might affect an individual producer for a little while, overall, it's not going to be much more than a rounding error." Trump weighed in Saturday on his rationale for the tariff hikes with a pair of Twitter comments. "The United States has an $800 Billion Dollar Yearly Trade Deficit because of our 'very stupid' trade deals and policies," he said. "Our jobs and wealth are being given to other countries that have taken advantage of us for years. They laugh at what fools our leaders have been. No more! "If the EU wants to further increase their already massive tariffs and barriers on U.S. companies doing business there, we will simply apply a Tax on their Cars which freely pour into the U.S.," he added. "They make it impossible for our cars (and more) to sell there. Big trade imbalance!" In 2017, the U.S. imported $151 billion more in goods from Europe than it exported to EU countries.